So how did I fare out?? 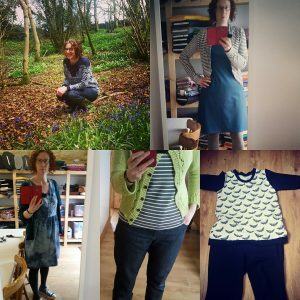 Well I wore clothes made by me every day of the month as I usually do – after a good 5 years regular sewing nearly all my regular clothes are my own creations. The reason for this is simple – comfort and fit. 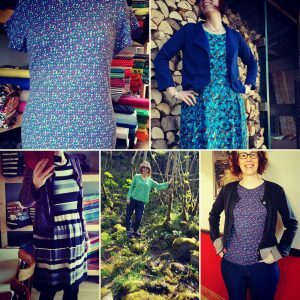 I have long since gotten rid (recycled & charity shop) of most of my shop bought clothes because once I was filling my wardrobe with my own clothing – I found I was wearing these regularly and the ill fitting RTW clothes were being left on the shelf. So that is my reasons for making my own clothes – comfort and fit down to the undies ;). Of course you also have more control over style and colours etc when you make your own. A new chapter in this story is beginning tonight when myself and a group of ladies who come to my sewing classes are to start a Pattern Making course. We have found an amazing teacher who is going to take us through a skirt, trousers and finally a dress block. I will keep you informed on our progress and if it all goes well we may run another course again in the autumn as we have had a lot of interest in it. 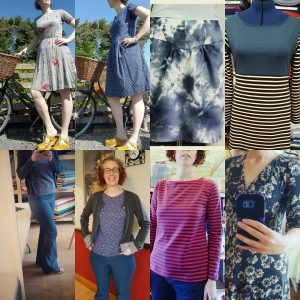 During the month I only documented new outfits – no one want to see me in my lounge pants and sweatshirts or many days of Morgan Jeans – there were lots earlier in the month. The heatwave that arrived for the last few days gave me an opportunity to pull out a few dresses that languish up on a high shelf and only occasionally see the light of day due to our inclement weather. Thats enough Navel Gazing for a Thursday Morning, enjoy the weather if you’re Irish – this might be it! !